I know I've said it on here before, but I do love creepy children. I mean really. Not the demonic kind, but the just plain evil kind. The Uninvited is a type of creepy child I haven't read before, though. 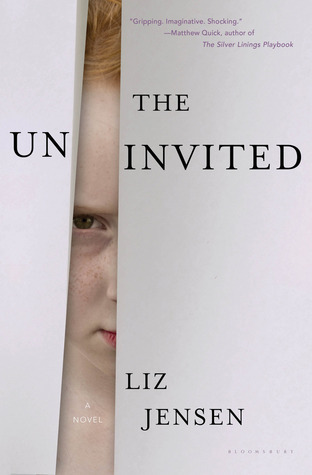 It's about an epidemic that sweeps the world and turns children into homicidal monsters. Hesketh Lock is our protagonist - an anthropologist with Aspergers, whose investigation of the phenomenon takes a personal turn when his stepson starts to show signs that he could be infected. I really appreciated the writing. I liked Hesketh as a narrator. The fact that he has Asperger's makes him interesting and unique, but I also think the author kept that from becoming the main focus of the book - which was a big plus for me. It made him a novel character and his quirks kept me interested, but it didn't feel like an "issue" book. The focus wasn't on his autism, that was just a small part of his character. My one complaint with the writing revolves around the ending. It was a little bit too abrupt and the message was a little overpowering. I could have done with less focus on moralizing and more focus on tying up the strings well. The reveal of the big twist just happened a little too fast for me to like it. That said, it wasn't such a problem that it kept me from enjoying the book. I was certainly entertained. It held my attention and I was desperate to know the reason for the children's violence. It didn't strike me as particularly gory or violent, although there are some violent and possibly disturbing scenes briefly described. The focus of the book, however, was less on blood and gore and more on Hesketh's characters, particularly his struggles as a father figure during a time when children are being rounded up and institutionalized. One aspect that really grabbed me was Hesketh's role in the life of Freddy, his step-son. Hesketh never actually married Freddy's mother and is not Freddy's biological father, although he loves Freddy as if he were his own. Hesketh's tentative role in Freddy's life is in jeopardy for much of the book, as Freddy's mother is unsure if she wants Hesketh to remain in Freddy's life. This family dynamic has captivated me in other books as well (An Accidental Mother is one example). I recommend giving this one a try if you're at all interested in more literary takes on dystopian fiction or maybe even horror. I'm also interested to hear what others thought of the ending. If you're interested in reading another review, my friend Kelly at The Well-read Redhead has a great review posted. Thanks for the shout out! :) Great review, I agree on all fronts. I think the ending was the only iffy part, but you're right--it doesn't detract from the book as a whole.